It has been a while since I’ve posted here. I wanted to share with you my latest Hair Transplant Class video which is a tutorial that many of you will need to watch. 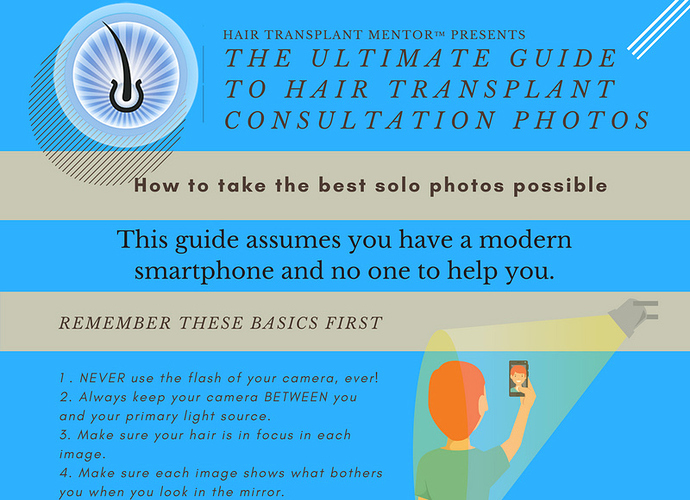 Throughout my career I’ve looked at tens of thousands of hair transplant photos and most of them carry the same challenges and they’re all a result of user error. I address several of those issues in this video and how to avoid them. After watching you can also download and save the infographic I made below. It is a handy tool to keep on your smartphone so you don’t have to watch the video over and over. It covers the basics that I discuss in the video and once you reference the infographic you should be able to remember the accompanying details. Happy shooting! Wow you must have spent a lot of time putting this together. I think photos are for obtaining a quote or an estimate anyway, the final approach will very likely change the day of the surgery. The approach can and does often change upon arrival but most of the time it is due to bad photos. When I worked in clinics I’d spent too much time asking for new photos or even typing up a tutorial for what angles were needed, the proper lighting, etc. and it got to be very repetitive. Following this guide will make things more efficient and help assessments to be more accurate. Wouldn’t it be easier to just do a short video with my phone? That s what I did when I had my online consultation. Yes, in general, it would be better but not necessarily easier. To start, the same angles would be best if included in any video but the problem with video is that perspective must be maintained and it’s difficult to keep the entire head in perspective while holding a phone at arms length going through all the motions. A tripod would obviously help with this but in my experience, the majority of video sent to me when I worked in clinics (and even now) wasn’t great because the perspective wasn’t considered. Doctors can’t make an evaluation if the video is too close or the angle of view keeps tiling one way or the other while the phone is being moved about. I’ve never once had a video sent to me that was shot on a tripod. Lighting is also important and the rule of thumb I discussed about the position of the light source is usually more of a problem because it is more difficult to shoot steady and usable video in the washroom like I was showing for photos. To do it right, and to make the video as accurate as possible, there is more involved when compared to taking photos. Another problem with video is file size. If you’re shooting one long continuous video it may be too big to send through email and then you’re looking at having to use services like Google Drive or Dropbox to send files. Easy enough to do but then you’re asking that the clinic be tech savvy enough to handle this type of transfer (you’d be surprised how many are not). Ultimately, video is better if it’s done right especially now that most new phones shoot 4K video. In fact, with 4k video you can take screenshots of the video to use as photos as they are roughly equivalent to about a 12mp photo which is more than enough (in the right light) but this video and infographic are designed for the most common denominator scenario and for those that have zero idea of how to do this right, which is most people. Kudos to you for using video and obviously well enough to get an assessment. If the assessment was accurate and you got what was estimated, and it turned out the way it was supposed to. It means you did it right. Thanks for the great read. This will really help those wanting to document and share their results in a transparent way with those thinking of getting a procedure.